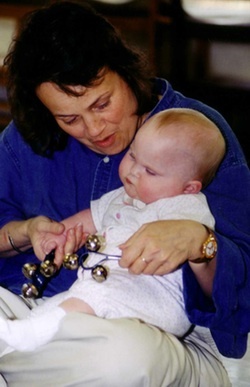 Transitional chatter began as my infant class moved from a dancing experience to the lullaby. One baby was fussing, another baby was babbling and a couple parents were whispering. I drew out my autoharp and as I drew my fingers across the strings, immediately a hush fell over the room. The whole atmosphere was changed in an instant. It was now calm, soothing and full of awe. The whole class was engaged, quiet and drawn into the soft melody. Like Magic! WITHIN AN INSTANT!! That’s the power of music! It’s “hammer time!” Parents were asked to tap the steady beat- “big big big big” on the bottom of their toddler’s foot with our soft hammer. 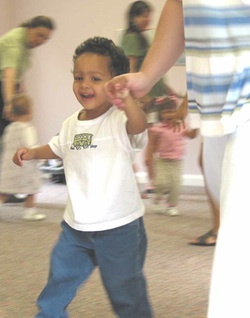 Wonderfully, the parents spoke the rhyme and tapped their child’s foot to the steady beat UNTIL we got to the words, “with a tap, tap, here and a tap, tap there.” The rhythmic power of the spoken rhyme was so strong it took over our attempt to keep the beat steady. Our hammers wanted to follow the rhythm of the words. We began to tap “the way the words go!” Wow! Language development! That’s the power of music! The preschool class has been reading, singing and moving to “The Bear Went Over the Mountain.” The book was read and sung the first week. For review, the second week I asked the children questions about the story: what happened first; where did the bear go after he went through the forest; did he go under or over the bridge? I wasn’t sure how they would answer because a week is a long time for a young mind to “hold” information that has been heard only once! But, because the story sequence and information was part of the ‘song story’ and we had moved to it and acted it out with hoops, the preschoolers remembered the sequence perfectly! That’s huge for a four-year-old! That’s the power of music! My school age children use songs to memorize really, really hard things. They can recite the books of the Bible, the US presidents, the periodic table and the states and their capitals. How? 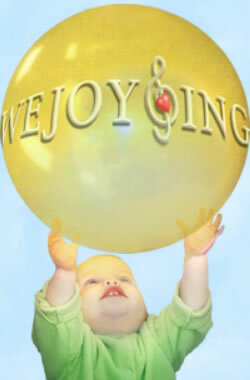 Because they each are a song or rhyme and utilize melody and rhythm to help retain the information. Amazing! That’s the power of music! 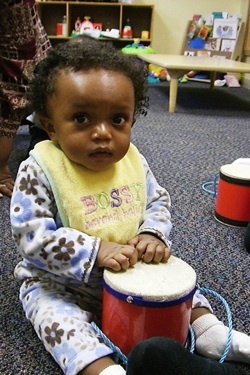 As a parent, I use music to de-stress and relieve frustration. Overwhelmed and exhausted by a hard day? Music can bring joy and peace. Even Mary Poppins knows that when you need to get chores done, music adds an element of fun. Try it! That’s the power of music! Even stores and restaurants know that music makes a difference. Research has shown that music with a fast tempo makes people move, eat and drive faster. It actually can alter a person’s heart rate. And music with a slower tempo actually slows down our heart rate and our actions. Incredible! That’s the power of music!